Oscillators, filters, waveform generator. BLOW OUT SURPLUS INVENTORY SALE! Made in Japan. BRINGING YOU THE BEST DEALS SINCE 2009! 50K Ohm Audio Taper. Shaft Length: 25mm including thread. 50K Ohm Linear Taper. Body Size (motor & Shaft not included): 32mm x 19mm x 20mm. Shaft Length: 20mm. With LED indicator to show working status. Resistance:50K Ohm. We will reply you ASAP. PCB size: 80mm 50mm. All products are sold for very reasonable and affordable price, Save evey coins for you! Part # MOC2499 90 72300430. Resistance: 100K Ohm. With LED indicator to show working status. We will reply you ASAP. PCB size: 80mm 50mm. All products are sold for very reasonable and affordable price, Save evey coins for you! This is a high quality product. Assembly consists of · Slip clutch. - Shaft extends 0.5” beyond the bushing and is slotted. · Forward and reverse were approx. Components and parts for over 40 years! Specializing in surplus electronic. Winter Park, FL. Skycraft Parts & Surplus, Inc. (En Español). Unit was pulled from a working system during a recent retrofit project, was inspected, cleaned and tested. 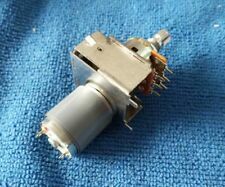 Sony 1-237-081-1110K Variable Motorized resistor. 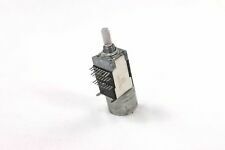 The motor runs 0-12 volts DC in either direction with a slip clutch for manual operation of knob shaft. Front mounting nut not supplied. This is the SONY 10K Variable Motorized resistor. These are new in boxes. You will get one piece. With Heli-Cal Motor Shaft Flex Couplers. What is Shown in the Pictures is What You Will Receive. I do have multiple available. This item is to be installed and maintained by qualified individuals. We claim no expertise in the use of this item. We accept no responsibility on the correct/incorrect application or installation of this item. Our in house technicians refurbish a wide range ofhigh failure, obsolete parts such as: AC/DC Servo Drives, Amplifiers, Touch Screens/ HMI's, Power Supplies, PLC's, Sensors, and virtually any industrial Circuit Boards. 10K Ohm Audio Taper. Shaft Length: 25mm including thread. 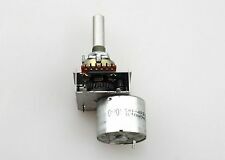 Body Size (motor & Shaft not included): 31.5mm x 20mm x 19.5mm. com by submitting the number. 10K mono linear taper. Resistance characteristic linear (B). Total resistance 10K ohm. With Motor - touch sensitive. 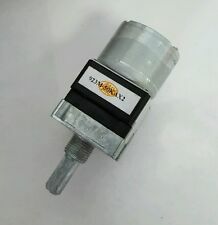 Shift force 0.8N - 0.5N 0.5N. Travel 100mm - Total length 146.5 mm. Travel 3.94" - Total length 5.77".